Maxon was introduced to word searches during our vacation by watching his cousin make sense of a big block of letters on the back of the kids’ menu. He diligently worked on his word search despite the fact that he can’t actually read the words he was looking for. The ambitious kid just matched each and every blessed letter in the word. We tried to find a word search book in the airport shops on the way home but we ended up with a more grown-up version that would be far too difficult for a 5-year-old. Or so we thought. During one of Cooper’s ski lessons, we sat out to the side and tried to find at least one puzzle that he could start with. On this particular one, not only did he have to match the letters, but they would not be in a straight line or diagonal. Not even backwards. These were in a square. To be fair, he did get a fair amount of direction and clues. But, you know… he’s five. 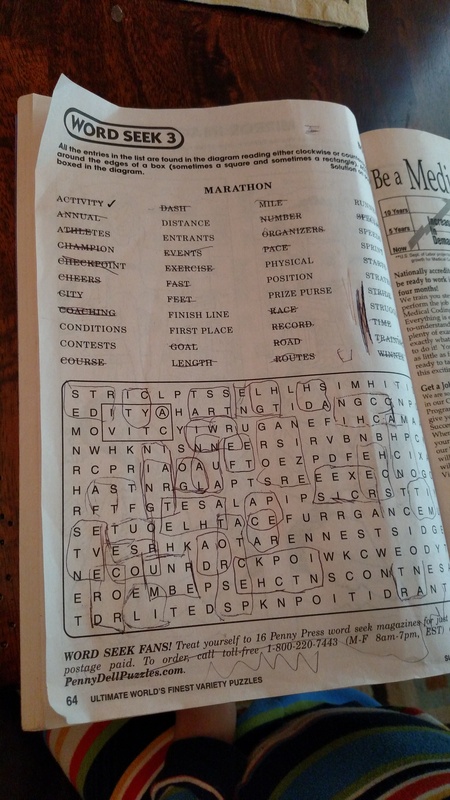 The other “word searches” that he could do were equally laborious. One had international city names that were so unusual that I first thought the letters themselves were mixed up and had to be solved before you could find them in the puzzle. As it turns out, literacy was probably a hindrance since Maxon just doggedly matched each letter the same way he did more common words. The other word search was missing all the vowels in the puzzle so he would have to pick a word from the list and then guess which vowels fit in the space… after a brief lesson on what a “vowel” is and a quick-reference key written at the top of the page. He also got into doing some simple math last year by way of an Android app and significantly improved his addition skills in the last few months with his obsession with basketball and keeping accurate running totals of his 2- and 3-point shots during a “game.” When watching real games, he would constantly ask the difference between the two scores to see how big the lead was. 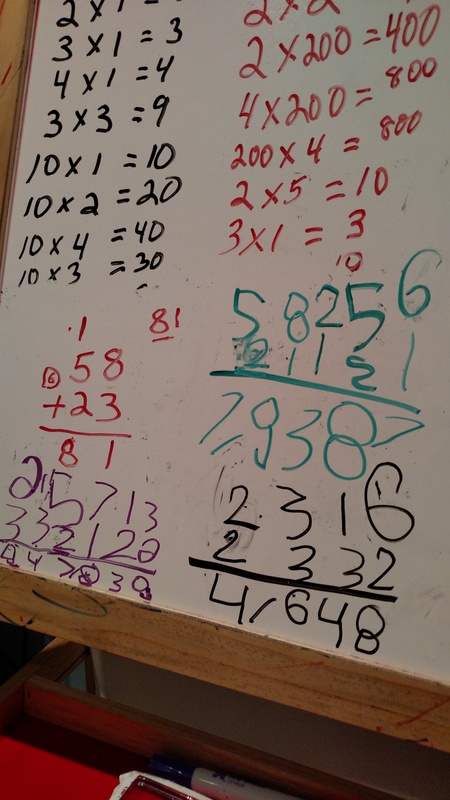 One day while getting ready for bed, he was giving me two 2-digit numbers and asking me to add them together. I’m not too shabby in that department but he blew me away when he gave ME the answer before I figured it out! I asked him how he knew, say (because of course my 37-year-old brain doesn’t remember the actual numbers), 47 and 39 added together is 86 so quickly. At first, he said he “just knew” but after asking again, he said something like 47 and 40 would be 87 but then he subtracted 1. Such a proud and terrifying moment to know that my ability to help him with his math homework might just end well before high school. Mike has been trying to introduce more advanced math skills since Maxon was so interested. Well, advanced for a pre-kindergartner. Since Maxon could add single and double digit numbers together, he taught him how he could do really HUGE numbers. It has opened a new door for Maxon’s entertainment. So much so, he entertains himself by making his own math problems! The concept of comma placement is still in process. He also doesn’t actually know how to “read” the total amount. Slacker.